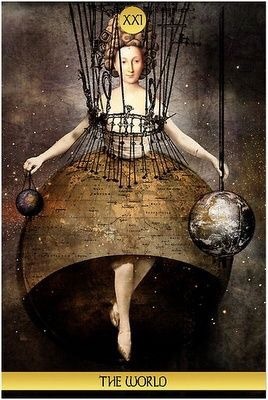 Where has Mercury retrograde affected you? I am anxiously awaiting June 8, my friends. One device says this post is published, another says it is not. Oh boy! So, if you received anything premature and funky, my apologies. Welcome to June! As I was pondering the wonderful placement of this World card today, I couldn’t help but think about how we all wish our lives away. Most of us are always waiting for that next year, or month, to be the big one, the one where everything finally starts to go right. Simply an observation, but I feel most are guilty. So, here we are, closing the door on May with its excessive and frustrating retrograde energies, and opening a new door to the month of June. Indeed a cycle is complete, but I do not feel all of you will find new doors opening today, simply because it is June. However, I feel this month holds great potential to close a couple major ones which have plagued you for quite some time. And, when you close one door, another will soon open; you know the saying. You should be starting this month giving yourself a much-deserved pat on the back for your accomplishments. You may not have made it all of the way, but your progress is definitely beginning to show. Be ready to enjoy the wild and crazy ride which is June, 2016. Keep your emotions in check as there is a powerful New Moon in Gemini Saturday/Sunday, featuring a Mutable Grand Cross. You have been wanting change, and it is about to find you! This entry was posted in Card of the Day, General Tarot, Readings, YouTube Videos and tagged Card of the Day, Cycles, Doors, Guidance, Path, Reading, Tarot, World. For how long now have you been working on this plan? If you possessed a roadmap or blueprint of your life, it would be so much easier. However, you are dauntless in the face of a new adventure. You think less of the old way of life every day, and your focus and perspective are focusing toward a sense of freedom in your life of which you will never want to let go. This New Moon provides the opportunity to work toward the new beginning you seek; you will find a release from at least one of the issues which has been plaguing you for so long. So, you are at the point that you have this restless energy because you know more is coming soon. You simply know it; but, you must try to go with the flow for a couple more weeks and continue juggling for the moment. The anticipation appears to be driving you crazy, for now you know the worth of every precious moment you exist and do not wish to waste any more of your time. By now, you can see, feel, somehow sense your destination drawing closer; it is one of safety, of surviving a painful transition and arriving at a better place. Maintain patience and balance in all things and do not go off half-cocked and jumping the gun. A stroke of good luck and excellent karma your way comes, right before the Solstice. Change is here and you have reached a very important goal along your path. After the Sun leaves Gemini, you will see your future approaching at a more rapid rate. Your goals have been redefined, and you are now on a mission to create a less stressful life. In the future, things which are stressful will be much easier to handle. You have learned more about yourself in this past year than possibly in your entire life. Now you know what you are made of, what you are worth, and, many of you have discovered some valuable new skillsets along the way. Travel is indicated for many of you, while others will receive news of financial opportunites manifesting themselves. It’s a WIN-WIN situation! I can hear the Mummers playing ‘Happy Days are Here Again‘ as positive vibes begin to return to your life. Hope, faith and optimissm are renewed, and you realize you are truly blessed in this life. Patience and perseverance is required with a desired commitment. Stay tuned, I think we will see more of this as it expands in the not-too-distant future. This entry was posted in General Tarot, New Moon, Readings, YouTube Videos and tagged Gemini, Guidance, New Moon, Path, Reading, Tarot. Why does everyone always try to run and hide from this card? I really had to search to come up with this image in order to convey my message. First, put your hand over the person; what do you see? The Sun!! Now, for many of you it has actually been 10 months of stress trying to figure out how to move away from the issues in your life. 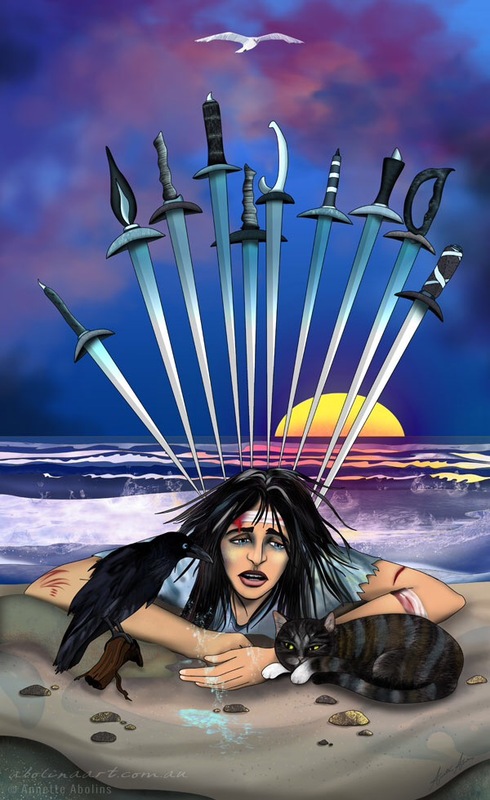 This would make a great card to follow a 6 of Swords, with our guy here washed up on the beach, finally making it to the shore. So, let us think about it. Here you are, the end of May. Yes! Tomorrow is June! Truly, you have been through the hardest part and the stress will begin to lift. So, time to pick yourself up, dry yourself off, and be ready for whatever is to come! This entry was posted in Card of the Day, General Tarot, Readings, YouTube Videos and tagged 10 of Swords, Card of the Day, Guidance, Path, Reading, Stress, Tarot. Make a wish, everyone! 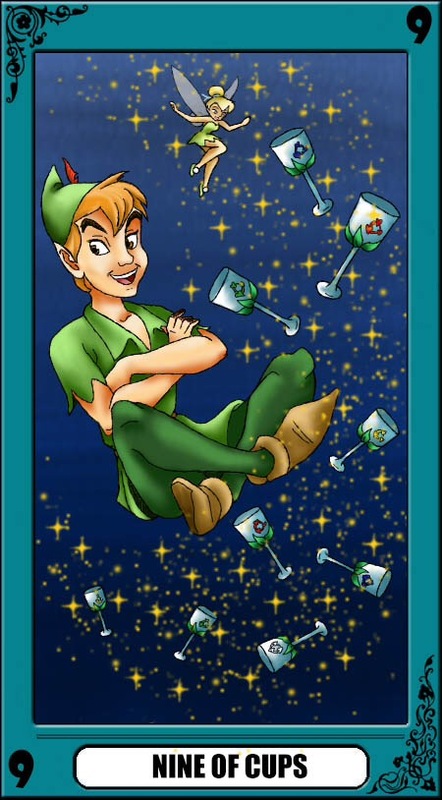 There is a special sense of fulfillment with this card, and I feel if you are reasonable with your wishes, the Universe will be obliged to comply. Tink and Pan can make this happen! No matter where in the world you are today, remember to honor those who have given there lives, so that you may live in freedom. This entry was posted in Card of the Day, General Tarot, Readings, YouTube Videos and tagged 9 of Cups, Card of the Day, Guidance, Path, Reading, Tarot, Wish. What an absolutely perfect card for us today, no matter in which hemisphere you live. In the U.S.A., it is Memorial Day weekend, the unofficial start of the Summer season. 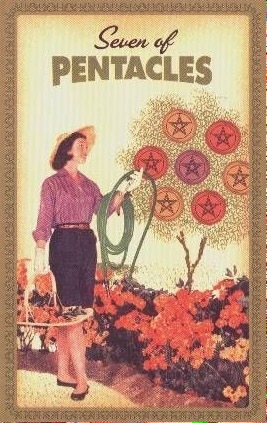 Our 7 of Pentacles comes to us from the 50’s-themed Housewives Tarot. This is exactly what many people are doing, tending to their garden, if they didn’t take advantage of the long weekend to head somewhere by water. Now, if you come from the land down under, and it is cold, it does not mean this card is not for you. While the depiction may be representative of the actions of many today, the meaning of this card is one of putting in hard work in order to reap the rewards you seek. It may be Sunday, and this does not mean you need to go out and work diligently in your yard, but there are many things on which to be focusing. Nurture the areas which need nurturing and growth; after Mars turns direct June 29, you will begin to see your efforts have not gone unnoticed by the Universe. This is a special month all the way around. Have a listen to this month’s Tarot Guidance. 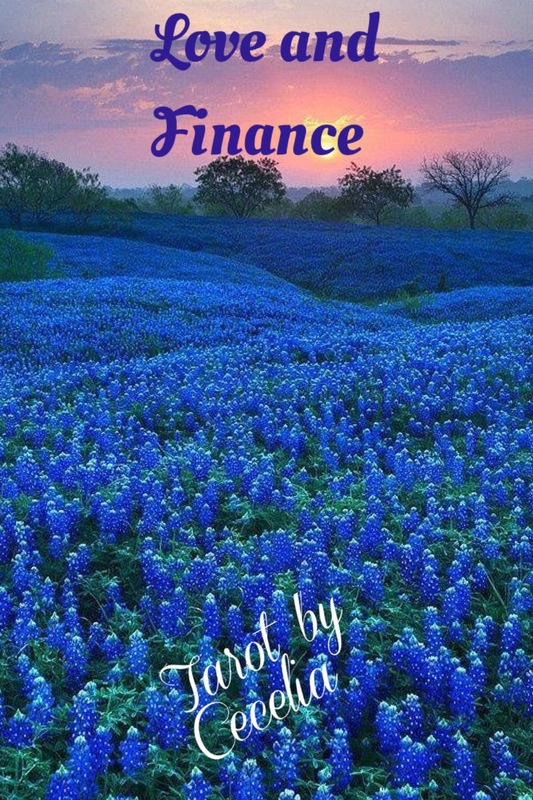 And, thank you for making my Love and Finance Tarot Guidance videos such a success! You have been working on transitioning to a better place and, as June arrives, it appears that your destination is drawing close. Mercury leaves shadow on the 7th and goes back into home sign, Gemini, on the 12th. Clarity and focus will be so much sharper by this time. You will finally feel as though all the clutter in your mind and your office can be prioritized, organized and dealt with in a proper manner. Security is still a huge focus for many, and some valuable insights from a trusted source could aid you in making some decisions. A few of you, now that the timing is better, may find yourself dealing with a financial institution, whether to open an interest-bearing account or to seek the necessary funds to help you reach the next phase. Your burdens do not necessarily feel any lighter, but you continue to shoulder them alone. Some days you wonder if someone isn’t sneaking up behind you and adding to the load. You’ve got this! There is a new beginning in here somewhere, but Mars in Scorpio is bringing up things which you need to address once and for all. These things can definitely run the gamut, so do not think this is bad. You may finally be able to break some bad habits, rearrange your financial structure, and do away with a burdensome relationship. For some it will be health issues, which while they may not be irreversible, there exists the possibility to create tremendous strides. Some days you may still feel a little confusion over the unknown, especially as you realize that you have been wishing for things which may never be possible. Remove the blinders and see how many things, people and situations can truly fulfill you. Holy Moly! The light at the end of the tunnel is in sight! You have been a long time trying to reach a particular goal, and finally there is motion in your favor. So much karma going on here; it may leave you feeling rather lucky, and truly appreciative after all of the past difficulties. This is no time to be idle. Get your self in gear and be prepared to start clearing your path as you will be ready to set off on a new adventure by the Solstice! I have had my eye on this for so long, for so many, including myself. I can honestly say that something begins at this point which is indeed an adventure like none you have ever experienced. You may have been dreaming fondly of this moment, but I think it needs some time to play out and you will be amazed where this part of your journey takes you. Time to close the doors on your broken heart, broken relationships, losses, etc. Do not spend your time mourning; be wise enough to get through that new door and take charge of your life. Finally, you can begin to feel like the master of your journey; your prayers have been answered and it is possible to breathe a sigh of relief at long last. Don’t make yourself too comfortable as there is much to do and take in along the way. By now, you know who is in your corner, and who is not. After Mars goes direct in Scorpio on June 29, it is ready, set, go! Dear Aries, it has probably felt some days as though you were simply hanging around waiting for your plans, wishes, hopes and dreams to come to fruition. Enough of the sacrificing already! If you seek fairness and balance in your life, it is time to take up the cause. Do not feel challenged by the unknown, just be ready to stand up for yourself. Patience with your responsibilities is necessary. You need to exercise caution and moderation with your own self and anything you may bring upon yourself which can cause undue harm. You will break out from feeling trapped this month and things will begin to flow a little smoother. You need to learn to be a little more easygoing in certain areas. Oh, the things which keep you up at night, Taurus! The biggest part of the struggle is within yourself and that determination to believe that there is only one way. It truly is time to expand your vision if it is real change which you seek. Be honest with yourself about all of it; there is a bit of a reality check going on here for you in June. Sadly, the very thing which provides the most security for you in life, is where you feel the most lack and hardship. Be realistic and down-to-earth in your choices; be practical about what brings you security. Developments late in the month will herald some of the changes which have felt so stalled for you for so long. Once Mars turns direct in Scorpio June 29, expect the pace to quicken. It is time to change some things up, Gemini. You need to begin blazing your own trails and set your sights on a new adventure which is comprised of your own vision. Sometimes, people stay too long at the party, and you have stayed far too long in a way of life from which you need to break out. If you possess strong entreprenuerial skills, this would be the time to begin flexing your muscles and working on your future. Do not worry about rocking someone else’s boat, or what will happen if you leave. The road to fulfilling your wishes is filled with drastic change and you have been turning a blind eye to the possibilities. If you do not have one in place, it may be time to create a new health routine designed to help you maintain your stride. This is a powerful month for you, Cancer. How your karma plays out in all of this truly depends on you. You, and only you, can end the cycle, close the door and stop the battle. The month may start off with you ready to pick a fight at the drop of a hat, but your true power lies in choosing the high road and being the better person. There is a group of three individuals of great significance in your life (one of them may be you, but not necessarily so) and there is a portal for change available here. The choice is yours and you need to know that you can lead your life for you and still have room for others to be in it, simultaneously reaching your goals. Hold your position, walk away from the fight and work on rebuilding the structure of your life. Leo, it is your kingdom so be sure to maintain your power. There is a clash of positives and negatives here and you may need to reverse your way of thinking with regard to a particular individual or situation in your life. You aren’t seeing all of the possibilites and what they could really mean to you. There is a feeling here of having made the wrong choice regarding something; it was totally your decision, no one else’s. You may think you chose the road which was right for you, but it is possible you will shed a few tears over what you have done. Finally your goal is in sight during the month of June, Virgo. Now that your wishes are manifesting themselves, it is time to seize your power and make choices in direction for your future. You have had good counsel helping you to arrive at this point. Forget what is lost, or who is to blame, it all happened so long ago, it is merely water under the bridge. There is a great deal of movement around you, possibly even physical travel of the back-and-forth commuting nature. There is an abundance of information and messages which come your way throughout the month, indicative of a new beginning for you by the end of the month, and ahead you will find exciting times. One never knows what might come out of your mouth, Libra. This month, your patience is being put to the test and you do not have all of the facts, so the only way to maintain balance in your world is through unconditional love. Keep busy with a hobby, or something to pass the time, because this is eating you up inside. You need to be wise enough to shift your focus to something more positive. There are a few surprises and tons of information to take in along the way. The news may rock you to your core and someone may show up like nothing was ever wrong. You need to remain firm in your position and know that by the end of June some positive action for change is finally being taken. June is the month to get ‘er done, Scorpio. Your biggest wish is to have a real life, and that needs to start with putting yours back in order. By the time you reach the 8th of June, you possess the clarity to reach a new level of organization. Mars retrograde in Scorpio through August 2 is helping you to rise to the challenge to put some issues to rest in your life, once and for all. You want what is fair for you, and it has not been fair in years. You will find that your hard work will truly pay off and with it comes change and some new plans. Stress? Not so much can get you down any more. Many of you Scorpios out there are at the precipice of that part of your life known as “your turn”. You have beat some insurmountable odds and your wishes are being fulfilled. You have no one to blame but yourself, Sagittarius. If you wish to have a new beginning and to open some doors, you will need to let go of the past. You are so unhapy about a particular situation and the status quo simply does not suit you. If you don’t bring it to this moment, you will not achieve the freedom you seek, most of which is mental freedom. Learn to be like a buoy in life. Remain cool, calm and collected and stop letting your past get in the way of what you would like to have. 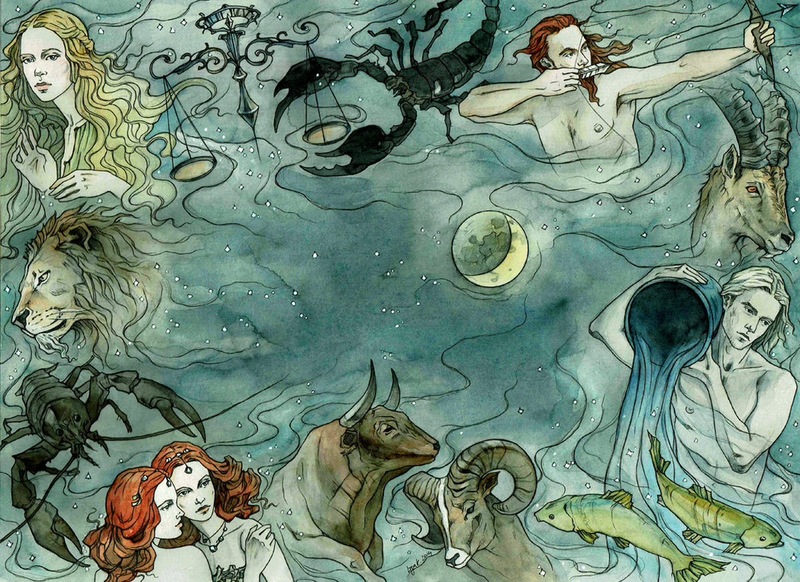 For a long time now, you have been your own worst enemy, Capricorn. You seem completely blind to cause and effect, however, in spite of that, things will finally be on the move this month. Some of the delays around you are gone and you may receive a special offer with a choice attached. Think three heads are better than one with this choice, as you have proven you can not see the long-term consequences of your actions. Your attachment to the past can be an unhealthy one. 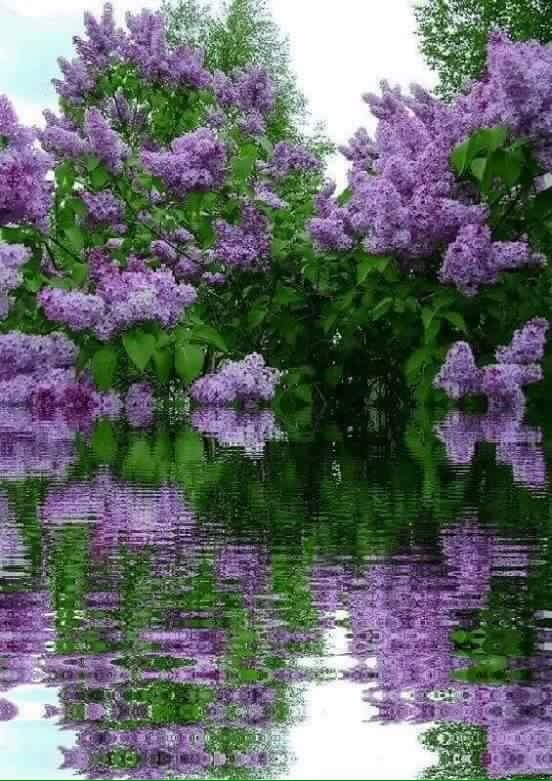 Remain balanced with your emotions, you do have some positives to celebrate. Put your focus toward comfort and security. Aquarius, if it is not what you want, then in June you should turn your back on it. You are so ready for your future and need to simply go with the flow. What others may consider a burden is deeply connected to you, but you still manage to maintain a carefree attitude. Yes, there are times you would love to make the more daring choice, but responsibility comes first in your book. Maintain a positive balance between intellect and emotion, for you have the skills to produce excellent results through your hard work and efforts. There is a new adventure just around the bend. Could it be that you can finally turn your back on some of the stress in June, Pisces? You may have a glimpse at the possibility of romance, but truly the timing is not right as your hands are still tied. You have some commitments and loose ends to work on at this time in order to enable your vision for a better life. Choices in direction need to be made and your creativity in securing a new beginning for yourself will be put to the test. It is time to overcome your issues and get back on that horse. Put your focus toward your own security for now, and by months end you will begin to feel the positivity wash over you. This entry was posted in Astro-Tarot, General Tarot, Love and Finance, Readings, YouTube Videos and tagged Aquarius, Aries, Astrology, Cancer, Capricorn, Gemini, Guidance, Leo, Libra, Path, Pisces, Reading, Sagittarius, Scorpio, Tarot, Taurus, Virgo.